I regularly ask my kids if they want to go running with me. They very rarely do. See, I remember how much I hated running when I was a kid and how I never really participated in sports until I started running in my late 20s—and then took a decade-long break from even that after Jack was born. I would love to get my kids past the hating running stage into the tolerating or even loving running stages well before that. Every once in a while I can get someone to run along with me, motivated by the challenge of being able to run soooo much faster than I can. I've been working on Sam lately, with little success, but when Certifikid offered me a couple free tickets to last weekend's Electric Run (think glow sticks, illuminated course decorations, and lots of peppy music on a night course), I thought that I might just be able to convince him to take on three point one miles with me. 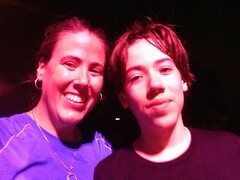 I chose Sam for this run because I decided that he was the kid most likely to (a) be able to finish the race and (b) not disappear into the darkness of the crowd. I love to run races, although I prefer to run straight-up timed events rather than the more gimmicky 5Ks that you see all over these days. When Certifikid (a fantastic deals site with family-friendly offers) offered me those tickets though, I flashed back to the Color Run I did where I'd wished that I had one of my kids with me to make the experience more fun. See, these races aren't timed and aren't about getting a PR. They're about going out with your family or friends and having a good time while getting some exercise in. I've done a few of them and even though my love is a regular, timed race, every once in a while it is fun to join in on a silly, themed race. Especially, I found out last weekend, if you're running with your kid. 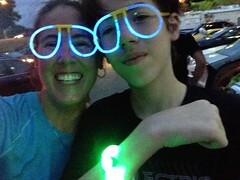 Quick disclosure aside, followed by promotional stuff: Certifikid gave Sam and me free entry into the Electric Run. If you're looking to do a fun, easy race with your kids (or even without! ), check out Certifikid. They have a bunch of race deals coming up (the Graffiti Run, the Rock N' Stroller, and the Blood and Guts Run, all in October) and they add deals on races all the time. If those three don't sound like the run for you, check back later because chances are they'll have a deal on one that is more your speed. Sign up to get their emails for your city or keep checking their site and you can get a great deal on a fun run. So, the race. You know when you have a 12-almost-13-year-old and they're the most fun in the world except when they flip a switch and become cranky tween/teens and you never know which one of those kids is going to show up? Well. It turns out that Racing Sam is Super Delightful Sam. We had so much fun. We got to the race site and picked up our packets, then festooned ourselves with various glowy things and headed off to the start line where I embarrassed Sam by taking lots of photos of MY BABY AT HIS FIRST RACE! It is hard to take decent photos in the dark. The thing is, I don't even think I embarrassed him that much because everyone else was just as goofy as we were. There was so much fun to look at and we didn't even have to wait too long because for once in my life, I timed our arrival almost exactly right. When it was our turn to go, it took us a while to break out of the crowd enough to actually run, but when we did, Sam delighted in sprinting ahead of me, then walking until I caught up, then sprinting ahead of me again, shouting back, "THAT is how fast you run?" Don't worry. Revenge was mine in terms of stamina. 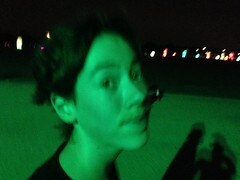 I can outrun the kid. It just takes me a while. Eventually Sam sort of tired out and it occurred to me that it was kind of mean to drag the kid to a race without having him train at all. (Although he ran longer than he ever has before. Go, Sam!) 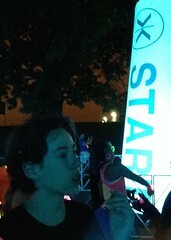 Regardless, it was still fun because there was a lot to look at and enjoy as we strolled the rest of the course. Plus—bonus!—if your kid has nowhere to go because he has to walk a mile and a half with you, he's going to have to talk to you. 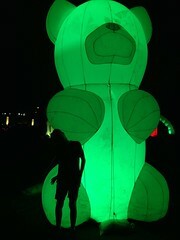 I kind of want one of these for my back yard. 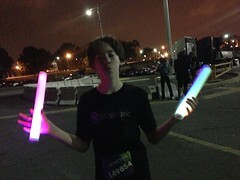 During the run, he was a little jealous of people who had these big foam glow sticks, so I was going to buy him one for being such a good sport about the whole thing. But then—and here is where you see that cheapness is apparently more important to me than hygiene—I looked into a trash can as we walked by and saw two glowing sticks just sitting there on top. I was even honest with Sam about where I got them and he was okay with it. Dumpster diving can be a family activity too. Gimmick or not, race as cash cow or not, Sam and I had a blast and I am so happy we did this together. I totally recommend you do one of these races with your kids. They definitely can be pricey, so finding a deal (Certifikid, anyone?) is a great idea. There are any number of themed races to choose from, depending on what you and your kids are into and like. I'm just happy that Sam and I got to be together to engage in a non-stressful, totally fun athletic activity—one that I think he will definitely remember. I am so very proud of him for sticking out the whole 3.1 miles (and the endless walks to and from the car) and I'm so glad for the time I got to spend with him. Sounds like it was a blast! Way to go Sam! Awwww...this made me smile on a kind of crappy day, so thanks for that. I'm glad you both had such a great time!! Such a sweet moment in time!